Be Brave, Keep Going: Muffin Tin Monday -Fall Back, Ack! Muffin Tin Monday -Fall Back, Ack! Welcome to Muffin Tin Monday! 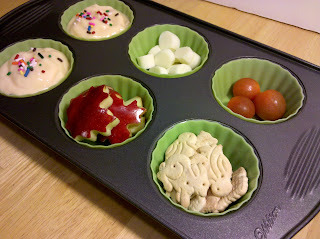 The world famous blog link up that features reader submitted muffin tin meals made by moms for kids. Have a "picky" toddler, preschooler, or older kid? Try serving their next meal in a muffin tin. You might be surprised at this simple mealtime food presentation is enough to get them curious about their food and willing to give it a try. I completely forgot about the time change here in the US, I had to photograph this week's MTM in the dark. The time change has me all in a funk. This was actually what we had for a snack at 5pm! We had to have "2nd dinner" about an hour later. oh well! The leaf shaped apples look great! Keep trying on the tomatoes...maybe someday you'll have success! Two dinners sounds good to me. Love the leaves. My 9 year old will still not eat tomatoes whatever way I present them. Lindsi B, there is a great bento link up at bentolunch.net every wednesday. also, you can always make after school snacks, desserts or even breakfast in a muffin tin (or make a lunch on the weekends) My kids go to school and I make mine on the weekends or for snack. hope that helps.